The City wants to better support and measure the effects of urban agriculture. 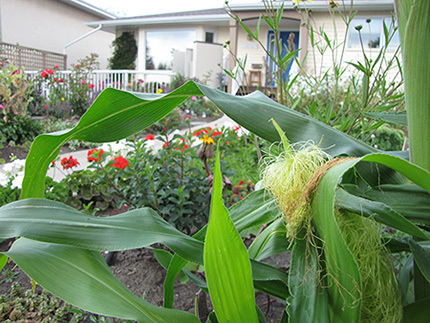 The Zoning Bylaw was recently changed to set rules for food production in Edmonton and fulfill policies in The Way We Grow and fresh: Edmonton’s Food and Urban Agriculture Strategy. Depending on how you plan to grow your food, you may need to apply for an urban agriculture development permit. If you’re looking to grow food on vacant lands, check out the Vacant Lot Inventory for Urban Agriculture provided by the City. If you are a resident or a non-profit group who wants to grow fruits and vegetables for your own consumption in your backyard or in a community garden, then you will not need a development permit. For all other questions related to fresh: Edmonton’s Food and Agriculture Strategy, please contact Kathryn Lennon, Principal Planner, Sustainable Development at kathrynlennon@edmonton.ca. For temporary or permanent greenhouses, plant nurseries, and garden centres, a development permit for a commercial use is required and commercial building fees apply. Selling your food products on or off-site. For more information, please review the City of Edmonton Zoning Bylaw. Please see Page 3 of the 2019 Development Permit and Compliance Fee Schedule for the appropriate fees for your development permit application. Bees may be kept on a property, as long as you abide by the urban beekeeping guidelines, and you have an urban beekeeping licence and the appropriate development permit. Hens may be kept on a property, as long as you abide by the Urban Hen Keeping Procedures and Guidelines, and have an urban hen keeping licence. A development permit is required for your hen enclosure and should be applied at the same time as your urban hen keeping licence. A) Animal products (chickens, bees, honey, eggs, etc.) are not allowed to be sold. B) If you want to sell your fruits, vegetables, and other products on your property, your Urban Outdoor Farm or Urban Indoor Farm will require a business licence, which you can apply for at the same time as your development permit. C) If you want to sell your fruits, vegetables, and other products at an Alberta Agriculture and Rural Development-approved farmers’ market, a business licence is not required.